But this week's episode isn’t really the right one to use as a platform for a meditation on trust. That was the theme of last week’s brutal, masterful “Down,” which now belongs on the shortlist of the greatest television depictions of a relationship in legitimate trouble. (Other candidates: episodes of The Sopranos, Cheers, Rhoda, and—scoff if you must—Friends.) 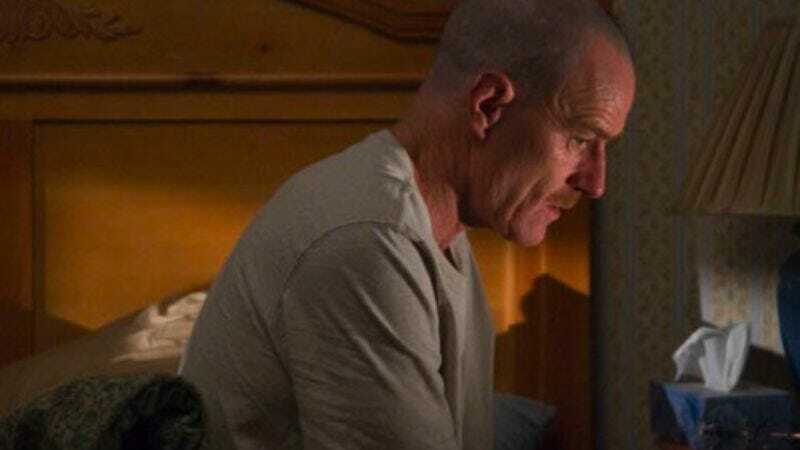 A week later, I’m still haunted by the image of Walt glaring at Skyler with a paralyzed expression, unable to figure out what magic prevarication will get his marriage back on track, so he can die in relative peace. That, my friends, was a dark, dark moment. And frighteningly real. This week’s “Breakage” largely set aside The War Of The Whites, aside from a climactic confrontation spurred by Walt’s discovery of Skyler’s crumpled up cigarette package, clogging the toilet he just puked in. But when he tries to play turnabout with her, questioning her consumption of a salty microwave panini along with her secret tobacco habit, she snaps back, “Perhaps I smoked them in a fugue state.” So yeah… there’s no reconciliation happening there yet. On the plus side though—or maybe not, for those of you who hate the character—Skyler is looking to bury the hatchet with her sister Marie. Maybe Skyler’s just looking for an easy win, since she knows the bad things Marie has done and can thus claim the moral high ground, but when she says to her, “I need my sister back,” I got the sense—as I did quite often during “Breakage”—that the writers mainly intend to start the next phase of the show, and don’t plan to spend a lot of time on unproductive old subplots. Another sign that things are moving forward: Hank got a promotion! Thanks to his dumb luck in taking down Tuco, he now gets more responsibility, heading up an operation that spans a large chunk of the Mexican border. Hank’s immediate response? Elation! Followed by an anxiety attack. Followed by a sick day so he can work on bottling his home brew. It’s fair to say that for all his tough talk, Hank does not feel as ready to take on all comers as he pretends. That character has become so much more than the veiled (and unacknowledged) Vic Mackey parody he was in Season One. Hank also provided a nice segue into the meat of “Breakage” with a rhetorical question he posed concerning the currently-in-limbo Albuquerque meth trade: “Who’s going to rally the roaches?” The answer: Walt and Jesse, of course. Though the two of them are still bickering about the details of their partnership, Jesse lets Walt know in no uncertain terms that he’s planning to cut out the middleman and become The Next New Mexico Drug Kingpin (a new reality show, coming this summer on Spike). Though Walt is skeptical that Jesse has the discipline or fortitude to be as tough as a kingpin needs to be—“Are you going to beat your ‘homies’ to death when they ‘diss’ you?” he asks sarcastically—he also knows that they both have bills to pay and no time to wait around for another Tuco to emerge. So he lets Jesse handle the sales end of the business. And warns him not to blow it. Here’s what excites me about this next phase of Breaking Bad: We’re going to get to see how a drug-trafficking business is built from the ground up, with all the attention to detail that this show does so well. And based on what we saw tonight, it looks like no matter how smart Walt is and how plugged-in to the underworld Jesse is, they’re going to have the same problems that every drug-based criminal operation has ever had. Breaking Bad is in one of those rare zones right now where nearly every visual, plot or character element is enriching the whole, from Walt’s petty concern about Skyler’s sodium levels to the comparison between his “home brew” operation and Hank’s. (It’s all chemistry man; and all about ways to satisfy cravings.) It’s a smart show that can introduce Hank’s beer bottles as a throwaway gag and then bring them back for a major payoff. When the bottles start exploding in the middle of the night, they feed Hank’s paranoia that his new job is sending him to certain death, yes. But the “breakage” also echoes Jesse’s speech to Walt about how rock-whore-heists are bound to happen in their business, and it illustrates how contents under too much pressure can burst out unexpectedly, causing an awful mess. That’s superior stuff. So superior that I won’t even grumble about the shot early in the episode of Walt throwing the “Hope” button that the chemo place gives him into the garbage. Sure, that shot was way too blunt. But I’ll allow it. Breaking Bad is doing too much right for me to nitpick the little things. -The mention of Gretchen and Elliot helping Walt pay his medical bills reminded me: Will we ever find out more about Walt’s past, and why he’s not a rich research scientist like his buddies? I don’t want to be too impatient for answers on a show that does such an amazing job of taking its time to explore the nuances of its premise, but I see from the previews that G&E will be returning next week, and I’d love to see Breaking Bad resolving some of that backstory. After all, this ain’t Lost. -Another example of every element enriching the whole on BB right now: the subtle contrast of Hank and Marie’s luncheon party and Jesse’s snack party, both of which take place in fairly arid locales. -I know from looking ahead at future episode descriptions that Jesse's new neighbor/landlord Jane is going to be a major character over the rest of the season. She should be an interesting addition to the show: the middle class girl who dresses and acts like a badass but probably isn’t. Another chance for Breaking Bad to explore that sliding scale between proper and improper. 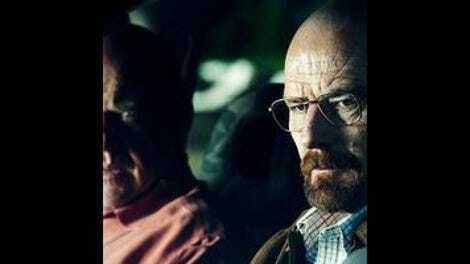 -Hey, Breaking Bad’s already been renewed for a third season! Ratings are up, reviews are strong, and AMC must like what they’ve seen of the rest of the already-in-the-can second season. In other words: Don’t expect Walt to die anytime soon.